As an American soldier during World War II, my father served in Great Britain as part of a medical unit. When the war in Europe ended with VE day in the spring of 1945, my father's unit was sent home. Unlike most of the others he had served with, who were discharged upon return to the states, my father was given a brief furlough and then sent to the west coast. Reporting to Fort Lewis in the state of Washington, though having directed a hospital laboratory in Britain, he was now to undergo weapons training as a medic prior to being deployed to the Pacific. 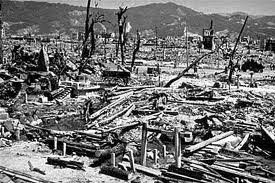 Days before my father's new unit was to be shipped out, the atomic bombs were dropped on Hiroshima and Nagasaki. The war in the Pacific was over. It was only over time that my father came to realize why the war had ended so abruptly. The enormity of what had happened was shrouded for him in the ecstasy of the moment, in the joy of war's end and in the promise of going home. As awareness grew in the months and years that followed of the untold suffering brought by the atom bomb, my father came to struggle with a great moral tension. What did it mean that he was spared from the war in the Pacific through the unleashing of such destruction on so many innocent people? Release came to him through the catalclysmic drowning of others in a sea of fire. He wondered what else could have been done. Why was Japan not warned, or its leaders not invited to witness a demonstration of the bomb's power? Through the years, my father has struggled to balance the elation he had felt in that redemptive moment long ago with the horror he came to feel later. In that moment the serving angels sought to offer a song before the Holy Blessed One. 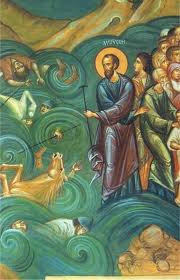 The Holy Blessed One said to them: My handiwork is drowning in the sea, and you would offer a song before Me? 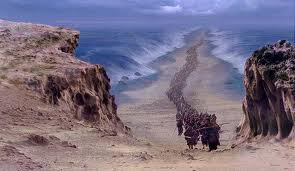 The Song at the Sea, Shirat Hayam, which is sung following the children of Israel’s safe passage through the parted waters, contains the central tension in the Torah portion B’shallach (Ex. 13:17-17:15). If God does not rejoice in the downfall of the wicked, the angels being told not to sing, then why are the Israelites allowed to sing? The Israelites are the ones who have just been saved, who had themselves suffered as slaves. Delirious in the moment of realizing they are free at last, it is natural for them to rejoice, song bursting forth in amazement. It would be unrealistic to expect otherwise. Their focus is understandably on themselves. Removed from the immediate experience of the Israelites, the angels are expected to have a deeper and longer perspective that recognizes the ultimate tragedy in the drowning of the Egyptians. Before we sing our freedom song we are meant to feel and internalize the tension of life lost in the process of redemption. This is powerfully taught through the Jewish ethical tradition of Musar, which here imagines even the Israelites on freedom's shore pausing in stunned silence before beginning to sing: ‘And God saved Israel on that day from the hand of Egypt, and Israel saw Egypt dead upon the seashore.’ They had not yet uttered song, they had not sung their redemption song nor sung concerning the downfall of the Egyptians, for they were greatly distressed; for all this, how is it possible to sing and to rejoice with complete joy when seeing a great camp of human beings strewn upon the seashore, writhing in terrible agonies, the dead and the dying? At the time the war ended, my father's response was like that of the Israelites at the sea, a response out of raw emotion. With the sobering perspective of time and distance, even though the same person, his reality became more like that of the angels, for whom, through remove, it was not appropriate to rejoice. As we sing the Song at the Sea, our challenge is to feel empathy, identification with the humanity of the other, however debased. This is the challenge that lies at the root of nonviolence as taught by Martin Luther King, whose life we celebrate when in the cycle of its reading the Torah brings us to the crossing of the sea. The Song we sing is about us and our response to events that affect our lives and our world. Though with ancient trope, if we sing the Song at the Sea as a victory song, we bring yet more triumphalism into the world of today. An interweaving of joy and horror, we are to engage the dynamics of the Song with awareness of its powerfully complex message, not simply as a celebration of our own redemption. Aware of the humanity of the other, may we bring the ultimate redemption of peace and freedom for all.